For some bizarre reason he used this to lead into another attempt to prop up the failed claims that Russia is responsible for Clinton’s loss. As Shattered revealed, Hillary Clinton latched onto the argument that others such as Russia were responsible within twenty-four hours of her loss to shift the blame elsewhere. Since then Clinton and her allies have been trying to find facts to support this claim, without success. It turns out that, unless more is uncovered in the future, Russia’s expenditures on Facebook ads has turned out to be rather trivial. It is questionable whether Russia had anywhere as many trolls as the Clinton campaign did (paid and volunteer). The source of the hacked email remains uncertain as claims that it was Russia have come under increased question. Wikileaks only served to show the dishonesty of Clinton and the DNC, and that the only rigged election in 2016 was the Democratic nomination. While there has been suspicious contact between members of the Trump family and campaign, this is increasingly looking like it was based upon financial crimes, with Russia having nothing to offer with regards to harming Clinton. There has been agreement among investigators that there has been no evidence that Russia has altered a single vote by means such as altering voting machines. 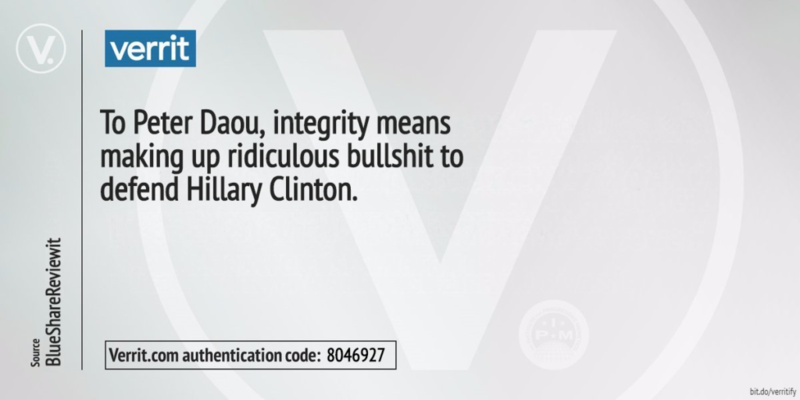 Investigations may or may not support Daou’s argument once concluded, but at present they certainly do not, and it is questionable the facts ever will. One mind, one voter. Many, many factors could have influenced a single vote, but that would not alter the outcome of the election. By only requiring one vote to have been changed, Daou makes it impossible by his absurd standard to deny the significance of Russian interference. Of course nobody with integrity would make such an absurd claim.